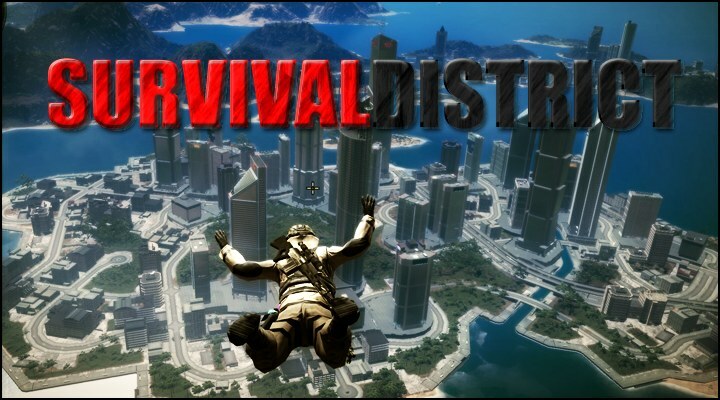 The whole gameplay is happend in the Financial District, you start with nothing and can't do anymore then run around. You have to find anything in the city. Currently there ~1200 loot spawn points in the financial district, all hand placed. It's always a bit hidden in a corner or something, you really have to search them but there should be loot everywhere. On the ground you can only find the basic loot, if you want better loot you have to go to the roof's, the best loot can only found on the highest roof's! It's not the fanciest but it's fast and simple, the inventory is splitted into 3 category's: Weapons (5 slots), Explosives (10 slots) and Supplies (12 slots). You can equip or use items by clicking them, to drop items you can use right click to select them, if you exit the inventory all selected items will be dropped in a player loot box. Your inventory will be saved when you leave the game (or crash)! In this first test release you DON'T loose you inventory when you die! I will change this when i added the global inventory! If you joining the first time or respawn, you do it in a Safezone where you can't attack or be killed. Currently there is only 1 Safezone. Can be found in level 3 and 4 loot. To plant a explosive, click it in your inventory. After that it will be highlighted red and if you click it again, it will explode! These explosions are raycasted, that means you can take cover behind a wall. You still getting damage but it's highly reduced! You can pick up your own explosive by pressing "E" near it (you don't have to point at it). Claymore: Kills everone in a radius of 5 meters an do damage to players in a 20 m radius. C4: Kills everone in a radius of 20 meters an do damage to players in a 50 m radius. Point at the position where you want to place the airstrike, then click it in your inventory. A plane appears in the sky, flying over the positon and dropping a bomb (or bombs). Cruise Missile: It's the fastest airstrike dropped by a Eclipse. Kills everone in a radius of 25 meters an do damage to players in a 80 m radius. Area Bombing: Takes a while but does immensive damage to a big area around the target position. The Bering drops 15 small and 5 big bombs with one attack. Tactical Nuke: Very slow but so big and deadly, it kills everyone in a radius of 60 meters an do damage to players in a 150 m radius. This server also have a improved hit detection with 3 hitzones (Head, Body and Legs). Currently it's only enabled for the Sniper, the other Weapons hit detection are improved by raising the OnFoot syncrate. A Headshot with a Sniper always kills, a body shot does 60% damage but decreased by 10% for 100 meters of distance. A leg shot does 40% damage and also loses 10% on 100 m distance. You can chop your enemy into pieces now with a meelee attack, currently a hit does 25% damage! I couldn't do it without the bubblegun, you can heal yourself and your friends when they in front of you. Everytime when you heal someone (including yourself), the player throws some sparks out of his body. You have to hold down the mousebutton, otherwise it won't work! It heals 5% every second. Death EMP: Everytime when someone dies, the baby panau statue near the safezone ignites a emp in his hand. You can hear that in the whole city! Wow, awesome job. This looks like a really cool, well-done gamemode. I'll definitely be visiting your teststerver later today. However I've played for about an hour or so but I couldnt find a grapple hook שlthough I found at least 5-10 level 2 loot boxes. Just had a play around, definitely has potential to be an awesome gamemode. It seems like the inventory system crashed while I was playing as my inventory would no longer show up, and I randomly acquired a grapple hook. they are very rarely i increase the drop rate for the grapplehook from 10% to 15%. It seems like the inventory system crashed while I was playing as my inventory would no longer show up, and I randomly acquired a grapple hook. script was broken for a hour, it should be fixed now. when the gamescript is broken all loot disappers too. wow! I love it when people are quiet for ages then come out with something awesome like this. Looks like great progress ING. Good work, can't wait to see more! Looks promising, I was just wondering when there would be a mode that focuses on one area of panua. Can't wait. Something really spooky should happen when you try to leave the city. The emp death is a nice touch! Excellent work! Great ingame description, very well placed loot spawns and a convenient inventory. Not to forget the explosives, airstrikes and all the nice details you've made. All in all an amazing gamemode! The only negativ thing I've seen are the late loading textures if you log out on a roof and rejoin. Just doesn't look nice, but at least you don't get stuck in the buildings. Since a lot of people play with controller it would be nice if you could make it possible to open the loot boxes with the same key you can enter cars. Really looking forward to play this with some more people. Keep up the excellent work. Vehicles can be unlocked with Lockpicks that can be found in level 1 Loot (1-3 * 10% dropchance), different vehicle types needs a different amount of Lockpicks. After unlocking the vehicle belongs to the player and he and his friends are the only players who can use it. Vehicles only respawn if they destroyed, under water or unoccupied for 3 days! Destroyed / under water vehicles respawn after 5 minutes, if they didn't had a owner they respawn after a minute. Other players can enter your vehicle when it has no driver, but when they enter the driver seat, they got electroshocked and jumped out (looks very funny btw). It does 20% damage. Own and friend vehicles has a green dot when you pointing at it. Vehicles can be destroyed with explosive and airstrikes, even when the unoccupied. If you wanna keep your vehicle save while you not playin, you should hide it. To make it bigger and better i script some physics effects that throws vehicles away from the explosions. To avoid problems with blowing up desnyc vehicles i improve the synchronisation of unoccupied vehicles. It's not fully sync yet, but it avoids some cases of desync. It has a little sideffect, moving unoccupied vehicles has bit laggy movement. I will improve this more with one of the next updates. In the Financial District you can only find unarmed cars and bikes. If you want a vehicle with guns you can find them rarely in City1 and City2, be sure you have at least 5 Lockpicks with you. Unarmed planes and helicopters can be found at the International Airport. Armed planes and helicopters can be found at the Desert Airport, you need at least 10 Lockpicks to unlock something there. If nothing is there, they are all picked up by other players. Currently there are ~200 Vehicles, everyone is unique! The Server hoster had some serious problems today (like every saturday evening), it shut down the server and i wasn't able to save the vehicle data. If you already unlock a vehicle it's lost, i put 5 Lockpicks into everyone inventory who was playin before the shutdown happends. I can not test the server. It will not pop into the list. PS. All allies must give me 1 lockpick for each play session for protection services. Seriously, this is addicting, very fun, and has a lot of potential. Due to the fact that the monstertruck floats in water, it most likely will take 3 days to respawn, as I checked on it after 20 minutes and it was still upside down ... in the canal. It should be classified as "underwater" if left alone in the water for over a few minutes(in my opinion). Question: Can or do unlocked vehicles respawn in the same place in the city? If not, that would make you spend a lot of time just to look for your unlocked vehicle. This is such a great gamemode - you should really rename it to "DayZ JCMP" because it's so similar. Script went down when we were playing today, though, hope it goes back up! Isn't the main feature of DayZ zombies? Yes, I concur. Script is still down. Yep, that was the second major crash after the first day But it's a good thing, i found that bug and fix it, so it won't happend again. It's online and i also add alot of stability improvements, new smart loot spawns (powered by crescentfresh) and a first secret. That secret gives you a short idea what im planning to do with this server (besides the other things): Exploration. You can very rarely found a item called "Secret 1" in level 1-3 loot. If you click it in your inventory, it sets a waypoint to the secret.